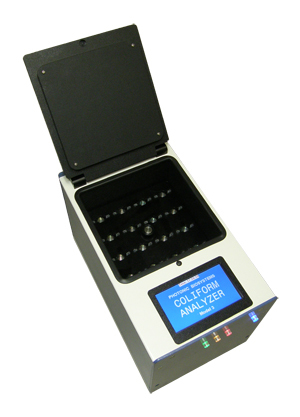 The Coliform Analyzer (e.g. the microbial bioanalyzer technology) is an automated bioassay system for rapidly testing, identifying, and reporting metabolic-activity of cells, microbes, and/or organisms in fluid samples and deriving information about the number of cells present, their growth and health status. Entities from fluid sample(s) are captured, concentrated, and analyzed within a unitized, contamination-resistant membrane filter cartridge. 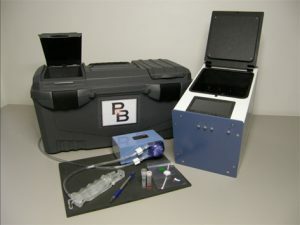 The bioanalyzer optically measures the presence of an entity, and changes in the entity over time, such as associated with growth and increasing metabolic activity with an expanding population of cells, or decreasing metabolic activity, for example, due to presence of inhibitory or toxic agents. The system is a truly innovative combination of methods utilizing proprietary membrane filtration assay cartridges, optical sensing algorithms, and temperature-controlled incubation to provide rapid detection of biological activity/contamination. The technology is the result of 10+ years of research and development funded by the United States Department of Defense to give troops a fast-as-possible water quality test. With high levels of contamination, the Coliform Analyzer can provide results in as little as 30 minutes; for a single bacterium- 8 hours. This all-in-one system automatically and continuously analyzes biological material(s) – including cells, their enzymes, or other constituents thereof – and immediately reports/alerts users and stakeholders of test results as quickly as biologically possible. While the technology was originally designed to be utilized by troops in rough terrain and hostile environments- its portability, rapid time to detection, and contamination resistance are features highly sought after in the microbiological testing industry at large. Fully enclosed MF assay cartridge and culture system minimizes the risk of contamination enabling sample preparation and testing in: the field (at sampling site), mobile-lab vehicle, or companies’ facility. Rapid testing enables same-shift test results, improved cycle time of in-process and final product release, timely cost-saving decisions to reduce inventory expenses, and rapid identification of process/environmental contamination sources. Portable, standalone instrument provides incubation, analysis, and report generation – all within one device – enabling testing to begin upon sample collection and results reported to users and stakeholders immediately upon detection/test completion.